Local politicians actually seek the relocation of settlers to their territory, for they bring with them election-winning votes in gratitude and increased federal monies. 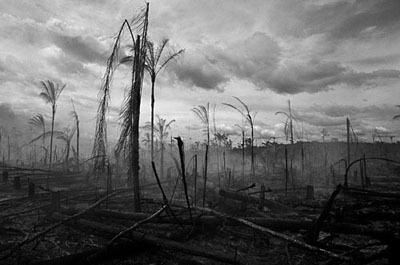 In Brazil, where 70 percent of the land is owned by 5 percent of the landowners, the politicians use the forested federal land in Roraima to appease the powerful Sem Terra - the "without land"- movement as opposed to redistributing the already cleared lands of the rich. 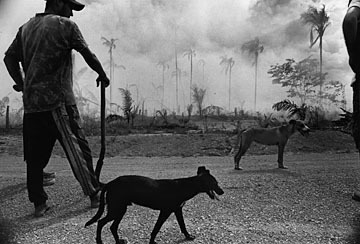 The families that do come to settle, like this farmer with his two dogs (right) often grow vexed with the lousy soil they find for growing new produce. The nutrients in the thin Amazon soil are bound with the teeming vegetation of the rain forest and thus many small farmers sell to larger landholders who turn the fields into cattle pasture. It is ironic that land cleared by fire fetches up to ten times more in sale due to the brief benefit fire brings to the soil, in terms of adding alkalinity. Cattle may graze for ten years on grass grown on this soil after which time it is tapped out. The herders will move on, leaving the land looking like a moonscape.